I'm back! It has been WAY too long and I do plan to hopefully blog more regularly in 2018, but for now I couldn't resist some holiday posts! 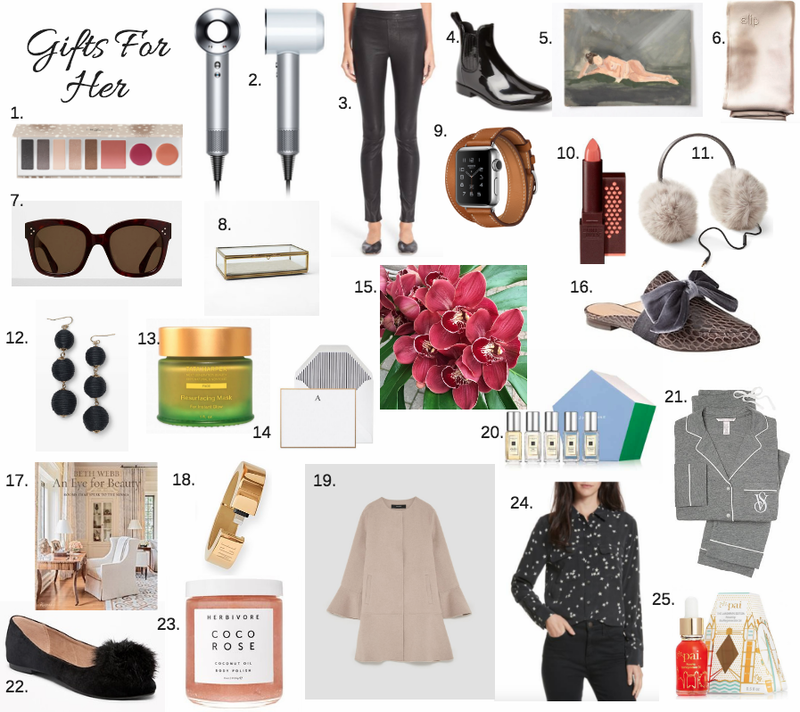 Check back during the month of December for more holiday inspiration and gift guides! First up, gifts for her! 1. Perfect holiday makeup palette from one of my favourite brands. 2. A definite splurge, but this hair dryer is one of the best out there. 3. Another wish list item! These leather leggings have great reviews and I have heard many say they are amazing. 4. Love these rain boots! They are on my list. Under $50. 5. There is nothing like original art, and I love the work of Laurie Anne. She has both originals and prints in her shop. 6. These silk pillow cases are supposed to be great for your skin and hair! 7. These sunglasses have been on my wish list for a few years now! 8. One of my favourite decorative boxes. Perfect as a jewllery box too. 9. A fun twist on the typical Apple watch, the Hermes edition is perfect for the stylish woman on your list! 10. A great neutral lipstick, under $10 too! 11. Cute earmuffs that have built in headphones. 12. The ever so popular bauble earrings. I still love them! 13. One of the best face masks, perfect for the dry winter months. 14. Monogrammed stationary makes a great gift. Can't go wrong with black and white stripes with gold trim. 15. Did you know most flower shops will do a 'monthly' arrangement that you can purchase as a gift? Check with your local florist! A great gift that keeps giving for months. 16. Stylish mules with a fun velvet bow. 17. For the home decor addict, this book is gorgeous and filled with inspiration. 18. This gold bangle is also an iPhone charger! It is available in silver and rose gold too and can be monogrammed. 19. I just picked up this coat, looks much nicer in person. 20. Love Jo Malone! This set contains a variety of their signature colognes. 21. I included this pyjama set last year and I have to include it again. So comfortable, my absolute favourite! 22. Cute flats for holiday parties! Under $30. 23. A luxurious body polish from a great brand. 24. These silk blouses are the best! A bit pricey, so one makes for a great gift. 25. Amazing face oil! Again, perfect for cold, dry months!